AL-MUHAYMEN is He Who holds supremacy over His creatures’ acts, sustenance, moment of death and all their deeds. Allah, the LORD of SUPREME SWAY, is the One Who surveys all affairs by His All-Awareness, Preservation and His Sovereign Sway. He is the Guardian of this world, the real essence of it along with all the worlds with everything awesome and delicate therein. He is the Guard Who preserves and protects every single thing, entrenching them against any assault that demolishes, eradicates or transgresses. On contemplating existence, you will find a balance that adjusts everything. 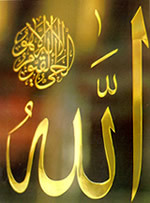 To Allah all supremacy and Exaltation is attributed; Glory be to the LORD of SUPREME SWAY, He is Allah.